We get quote requests and phone calls from people wanting cheap custom t-shirts. The connotation of cheap has nothing to do with quality but rather the price. As a manufacturer we don’t like to use the word cheap because the reference directed at quality. So we understand what our potential and current customers mean, they want something price low. This is where it gets interesting because we are dealing with a product that is completely custom. Just like buying a car or putting in a new kitchen, there are options available that can determine your price and those options determine whether or not it fits your budget. We don’t deal with bells and whistles with custom t-shirts but there are options that determine the price. 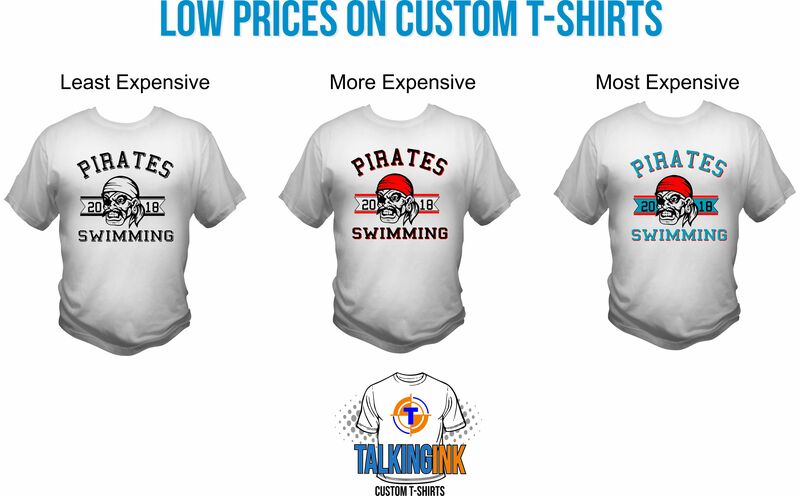 Getting low prices on custom t-shirts is no different. Here are these options – or determining factors when it comes to pricing. The most important factor that all custom t-shirt pricing is based on is the quantity of shirts, or sweatshirts, bags, towels, hats, etc., being ordered. The more shirts you order the smaller per shirt price you pay. Someone ordering 12 shirts is paying more per shirt than someone ordering 36, 100, or 1,000 t-shirts. The reason for this is simple. The cost of the t-shirt is fixed and the time involved in setting up the presses to print is also fixed. The time involved in setting up a job for 12 shirts or 12,000 shirts is the exact same. The cost to print the shirts get smaller as the quantity of shirts get larger. The larger the quantity the smaller the per shirt price will be. Low prices on custom t-shirts is first determined with quantity. The next factor is the design. The more colors in the design the more expensive the per shirt price will be. The more shirts in an order the more colors you can have in the design and still receive a cost effective price. For instance, a 6 color design on a 12 shirt order is a more cost prohibitive approach than ordering a 6 color design with a quantity of 144 t-shirts. So all of the pre press work that takes place on a 6 color design is the same no matter the quantity of the shirts. So cover the expense of the time involved in pre press, shirts are priced accordingly with smaller quantities costing more per shirt than higher quantities. Custom t-shirt designs that are made up of 1 color or 2 colors take less time at pre press. Therefore designs with less colors cost less per shirt than shirt designs with more colors. Our pre press time is the same on every single job. The only factors that change that are the number of colors in the design. The more colors we have to separate and burn screens for the more time it takes us. But pre press time is strictly based on design and the number of print colors, not the quantity. Low prices on custom t-shirts is based on the design and what’s involved with the number of colors in a particular design. Where your design will be printed factors into the price. A front print will be priced lower than a shirt with a price on the front and another print on the back of the shirt. Once quantity and colors are determined, print locations factors in because that determines how many times a shirt is handled in-house and set up time. If we print a shirt order that is a front print only, the shirt gets printed, sent through the dryer, folded, stacked and boxed. We touch the t-shirts once to print. If a t-shirt order calls for an additional back print, then we have to print the front image, send it through the dryer, lay it out, then when all of the front prints are finished, we have to break down the press and setup and back image. We print the back image, send it through the dryer, fold it then box it. So the shirt is being handled twice instead of once. The more print locations a shirt has the higher the per shirt price will be. The last determing factor in low prices on custom t-shirts is the style or brand of shirt. Everyday brands such as Gildan, Anvil, Jerzees, Hanes, and Fruit of the Look cost less than fashion brands such as Next Level or Bella. preshrunk cotton t-shirts are less expensive than a triblend shirt made of cotton, poly, and rayon. 100% poly performance fabrics are more expensive that basic cotton t-shirts. Full zip hoodies are more expensive than pull over hoodies. So the type of apparel you want to have printed and the brand and material from which the shirt is made are the final determining factors in pricing custom t-shirts. So needless to say our goal is to save each client money while at the same time providing them with the highest quality screen printing we have been producing for over 20 years. In other words, value. If they contact us with a cost effective order, great. If they contact us with what we determine would be considered a cost prohibitive order, we talk with them and provide them with options to try to save them money where we can. Low prices on custom t-shirts has more to do with these factors and nothing to do with quality. Here is just a synopsis of best practices to help you get started. If your quantity is smaller, in order to keep them cost effictive you want to stick with one or two print colors in your design and one, maybe two print locations based on your exact quantity. You wouldn’t want to order 12 shirts with a 6 color design or a front and back print with multiple print locations. Keep it simple with smaller quantities. The smaller the quantity the smaller number of print colors you want. You can play around with our online t-shirt designer and see how price is determined by adding colors to a design and quantity. We are always a phone call away to answer as questions as well. To check out our online custom t-shirt designer you can follow this link.